The cell that can produce laser light | UNBELIEVABLE! Have you ever fantasised that you’re a Super Hero who can shoot laser beams out of your eyes? Well, this has been turned into a reality on the microscopic scale. 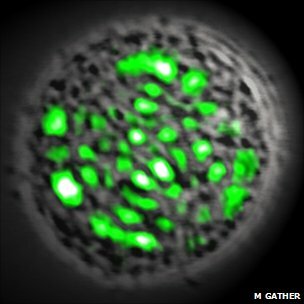 In a triumph of genetic engineering, scientists from the Wellman Center for Photomedicine at Massachusetts General Hospital have caused a living cell to emit laser light. They describe it as a “self-healing” laser, as the cell remains alive during and after the process, and if any light-emitting proteins are destroyed, the cell can simply produce more. It’s like giving a cell the superpower to be an invincible torch. It all began when scientists took cells from a glowing jellyfish, individually placed them between two tiny mirrors, and flooded them with blue light. This caused the cell to emit a beam of green laser light. The scientists have now engineered human kidney cells to produce the same protein that can turn the cell into a living laser-maker. What are the benefits to this? Well, the researchers behind this work, Malte Gather and Seok Hyun Yun, believe it could revolutionise microscopic imaging, and therapy. However, the application of turning us all into Super Heroes who can blast enemies with laser beams remains a long way off. Posted on June 13, 2011, in Biology and tagged Cells, Genetic engineering, Glowing jellyfish, Lasers. Bookmark the permalink. Leave a comment.